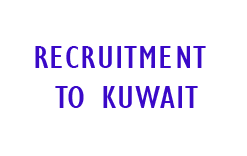 Urgently Requirements for the following experienced candidates for Kuwait Seaport Operations. Shortlisting from 5th January 2017 to 10th January 2017. Supervisor – Electrical – Mechanical etc. Technician - Electrical – Mechanical etc. More and further details about the jobs click the below link!